This post is by request as I’ve been told the blog needs more about elephants. There has been terrible news for the last fortnight so I’m happy to turn to a topic that at least one reader might actually enjoy. London is one of the blog themes, so these aren’t just any elephants. They’re London elephants. Mercifully there aren’t any live elephants in London now as far as I know since the zoo shipped theirs out to Whipsnade years ago. But if you look, there are plenty of others. First up, naturally, the ones that come with castles. Elephant and Castle is where the bad dentist who was eventually struck off had a practice, resulting in the confusing news headline ‘Elephant dentist struck off‘ and later on, this far less confusing blog name. The name goes back to at least the 15th century and a sign with the elephant image, the badge of the Cutlers’ company (in a reference to ivory). 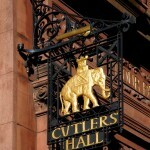 The Cutlers’ website shows plenty of elephant imagery including on their coat of arms. They still have a guildhall in the City. Next week I’m going to see the National Theatre’s production of Twelfth Night. A line in the play shows that Shakespeare knew the area. Antonio tells Sebastian, who needs a place to stay, ‘In the south suburbs, at the Elephant [probably meaning a tavern], is best to lodge.’ The area hasn’t had that kind of reputation lately but there’s a huge regeneration programme underway that includes a new green space, Elephant Park. I don’t expect there will be elephants. The local arts festival is called Elefest, but again no elephants. Elephants with castles on their backs also show up on the walls of the Indian High Commission (India House, Aldwych), but here you can clearly see that the castle is actually a howdah. There are some beautiful centuries-old Indian elephant chess pieces in the Victoria and Albert museum. These would most likely have been the equivalent of bishops rather than rooks, and show war elephants, since chess was a battle game. Here’s one (V&A image used with permission). The ivory is too old to be illegal but still, better to look at some painted elephants instead from a wall near me (21st century Rajasthan). It looks like they’re on a tiger hunt. Back at India House, there are stone elephant’s head statues flanking the entrance. These are not great to look at, but better than the elephants on the façade of Africa House on Kingsway, a 1920s building with a hideous portrayal of ivory hunters. I’m not showing that. Here’s an India House elephant’s head, in profile. Until recently I worked in Hawley Crescent, at the Open University’s London centre. The Elephant’s Head pub is on one corner of the road. At the other end is Elephant House, a listed building, once the bottling plant for Camden Brewery. The brewery used to make Elephant beer and the building has elephant imagery in stone. Back in 2010 a herd of 260 small elephants appeared around London as part of an art project raising funds for small elephant conservation. Here are a few along the Thames. Also in south London, we’ve had the Dali space elephant and a giant elephant sculpture in Waterloo station. A short way along the riverbank from the spot above you get to Gabriel’s Wharf and Ganesha, which can sell you an ugly macrame elephant’s head for no good reason, but has a pretty pink shopfront. Now we’re on the way back to the Elephant, as everyone local calls it, where there used to be a notorious gang known as the Elephant boys. Muriel Spark wrote about them in a short vicious novel, The Ballad of Peckham Rye (1960). News stories now are more likely to be about the regeneration controversies as the vast 1970s-built Heygate Estate has been demolished and replaced by fancier high rise apartments, and eventually by Elephant Park.